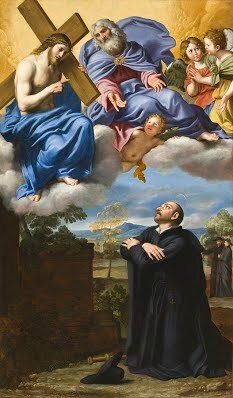 July 31 - Saint Ignatius of Loyola, Priest - Memorial - My Catholic Life! Like so many other male saints, today’s saint began his adult life as a knight and soldier. In the service of a local noble, he learned the male sins that armies and royal courts excel in teaching: gambling, fighting, treachery, and womanizing. When courageously defending a fortress in Pamplona, Spain, Ignatius was hit by a cannonball. One leg was shattered and the other badly damaged. A long and painful recovery ensued. During this convalescence, it could be said that he decided to exchange his service from an earthly to a divine Lord. But such a description would be incomplete. Ignatius’ conversion developed, over time, into a far more subtle and profound reflection on self-awareness, prayer, and radical commitment to Christ and the Church. For all of his worldliness and martial experience, Ignatius’ conversion started, ironically, with books. To counter the endless boredom of his recovery, he began to read about Saint Francis of Assisi, Saint Dominic, and other saints. He wondered if he could be like them. And then he wondered, a minute later, if he could court and marry a beautiful woman he desired. And then he was carried away thinking about new military expeditions. And on and on his mind wandered, as most minds do. But then came a spiritual breakthrough. Ignatius reflected on his own thoughts and emotions. He plumbed his own depths, in the tradition of Saint Augustine, analyzing the “shelf life” and quality of his mental experiences long after they had passed. He observed that reading the lives of the saints and thinking about earthly adventures were both pleasurable. But as time passed, reflection on holy things did not dissipate, while thoughts of earthly pleasures did. Saint Ignatius’ astute spiritual self-reflections spurred him to change the entire trajectory of his life. He wanted permanent happiness. He wanted joy. He repented of his past sins and decided to walk the way of the saints. Saint Ignatius documented his spiritual progress, eventually publishing his insights in his classic, the Spiritual Exercises. Other saints and mystics had previously written profound reflections on the normal objects of Catholic devotion. But Ignatius focused on the subject of prayer —the human person—as well as the object of prayer—God. The mystery of God was equalled by the mystery of man. Ignatius was an innovator in describing the psychological process of praying, in advocating a systematic examination of conscience, and in encouraging a planned method of introducing to the imagination specific biblical scenes or other objects of Christian faith for reflection. The Spiritual Exercises taught the Christian to profit from himself. Saint Ignatius had an eventful life of wide travel, study, and apostolic activity after his conversion. His high ideals and creative leadership drew many followers. He chose a military name for his new order—the Company of Jesus. By the time of his death, this Company was wide spread, and continued its meteoric growth to become the preeminent Catholic order of men in the world. It is not too much to say that the Jesuits saved Europe from Protestantism, evangelized entire countries by themselves, educated the higher classes of many nations for centuries, and taught a Catholic humanism of the highest caliber. “One man and God make an army,” a saint once said. Ignatius supplied the soldiers, and God did the rest. Saint Ignatius, may your method and example of prayer, mortification, and study inspire all modern apostles to make Christ the destination and the path, the end and the means, the way, the truth, and the life. ST. IGNATIUS was born at Loyola in Spain, in the year 1491. He served his king as a courtier and a soldier till his thirtieth year. At that age, being laid low by a wound, he received the call of divine grace to leave the world. He embraced poverty and humiliation, that he might become more like to Christ, and won others to join him in the service of God. Prompted by their love for Jesus Christ, Ignatius and his companions made a vow to go to the Holy Land, but war broke out, and prevented the execution of their project. Then they turned to the Vicar of Jesus Christ, and placed themselves under his obedience. This was the beginning of the Society of Jesus. Our Lord promised St. Ignatius that the precious heritage of His Passion should never fail his Society, a heritage of contradictions and persecutions. St. Ignatius was cast into prison at Salamanca, on a suspicion of heresy. To a friend who expressed sympathy with him on account of his imprisonment, he replied, “It is a sign that you have but little love of Christ in your heart, or you would not deem it so hard a fate to be in chains for His sake. I declare to you that all Salamanca does not contain as many fetters, manacles, and chains as I long to wear for the love of Jesus Christ.” St. Ignatius went to his crown on the 31st July, 1556. Reflection.—Ask St. Ignatius to obtain for you the grace to desire ardently the greater glory of God, even though it may cost you much suffering and humiliation.